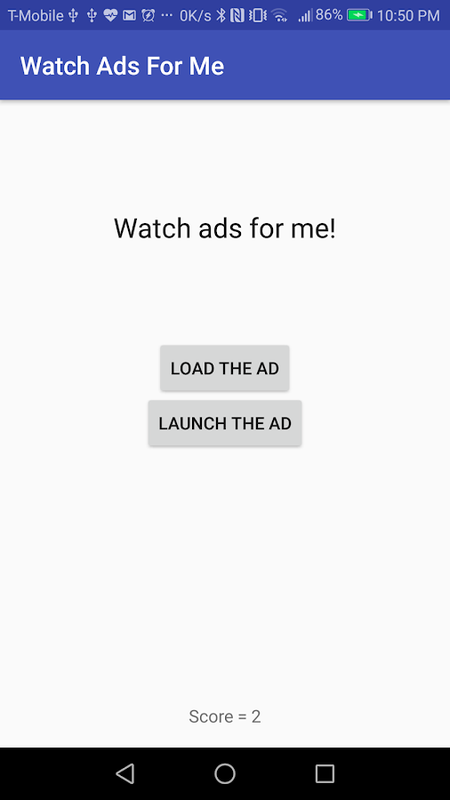 This app gives you access to hundreds of ads worldwide. Clickloadad and then watch ad and enjoy. Build up your ad score. (Scoreresets every app use) See who can get the highest score inonesitting. This app does nothing else. Pro version comes with Spotify, and Play Music integration (onlyworks if you have a subscription with the two) , standalone youtubeintegration, NO ads, and NO song limit! To use spotify, first openspotify in the background. Then send the message. You do not needto do this for google play music.Never pass the aux cord again.Just tell your friends to text you their song. How to use - Connectyour phone to a speaker. Open the app. When someone sends you amessage with the word "song" (SPACE) their song's name, the appwill add the song to the queue and will play one song afteranother.Example) Song shape of you, Song hello by adeleUseful forlong car rides, parties, group meetups, and study sessions-Carrides- You can connect your phone to the car's stereo and everyonecan access it. "Pass the aux cord" is a thing of the past withJuke. Juke is an invisible infinity aux cord.Parties - Host a partyand let guests send in song requests with an simple text message.Juke is a great replacement for an expensive DJ .Disclaimer -Use ofjuke for commercial purposes in restauants, bars, pubs, etc may notbe legal in all countries. Use at your own risk if you are usingthe app in a commercial setting. To come up with a legal solutionif you want to use this at a business, email the developers. Find your phone without internet. Disclaimer: Due to differences inthe implementation of READ_SMS across different Android devices,the service is not guaranteed to work on every device. The app hasbeen tested and works on a majority of smartphones. Lost your phonein your house? Set it to silent mode? Worry not! Just text yourCustom alert keyword to your phone to start ringing and vibrationeven if its on silent mode. Still can't find it? Text the GPSkeyword to find the physical location of the device. The app willsend back coordinates,as well as, a link to the Google Mapslocation of the device. The finder phone does not require any app.You can find your phone from any device through a simple SMS. Ifthe service doesn't work, please go tosettings>applications>find phone with SMS>permissions andgrant all permissions. Nice meme fellow memers! The Nice meme application allows dankmemers to experience niceme.me in app form. Beat your friends scoreby firing the meme cannon. Features-Nicememe full screen taprefresherHigh-quality sound from the meme cannonTrack your edgescore and compete with friends with the nicememe counter. Never pass the aux cord again. Just tell your friends to text youtheir song. Get the Pro version to sync the app with Google playmusic and spotify if you have subscriptions under these services. (No queue on these services, instaplay enabled)How to use - Connectyour phone to a speaker. Open the app. When someone sends you amessage with the word "song" (SPACE) their song's name, the appwill add the song to the queue and will play one song afteranother.Example) Song shape of you, Song hello by adeleUseful forlong car rides, parties, group meetups, and study sessions-Carrides- You can connect your phone to the car's stereo and everyonecan access it. "Pass the aux cord" is a thing of the past withJuke. Juke is an invisible infinity aux cord.Parties - Host a partyand let guests send in song requests with an simple text message.Juke is a great replacement for an expensive DJ .Disclaimer -Use ofjuke for commercial purposes in restauants, bars, pubs, etc may notbe legal in all countries. Use at your own risk. To come up with alegal solution, email the developers. Find your phone with SMS without internet. Disclaimer: Duetodifferences in the implementation of READ_SMS acrossdifferentAndroid devices, the service is not guaranteed to work oneverydevice. The app has been tested and works on a majorityofsmartphones. Please try the free version to see if your deviceissupported. The app is refundable for 30 minutes afterpurchase.Please refund if the app does not work. Contact me and wecan worktogether on possibly supporting your device. Lost yourphone inyour house? Set it to silent mode? Worry not! Just textyour Customalert keyword to your phone to start ringing andvibration even ifits on silent mode. Still can't find it? Text theGPS keyword tofind the physical location of the device. The appwill send backcoordinates,as well as, a link to the Google Mapslocation of thedevice. The finder phone does not require any app.You can findyour phone from any device through a simple SMS. Sets your phone wallpaper to the hottest/newest picture postfromthe selected subreddit. Automatically resets the wallpaper tothehottest post of the subreddit based on an interval you set.RedditWallpapers makes sure your phone stays fresh with newpictures onyour wallpaper. Its a refreshing experience! Somepopularsubreddits based on photography- r/wallpapersr/mostbeautifulr/earthporn r/skyporn r/spaceporn r/space r/art*Please disable appoptimization if Redpapers does not update at theright time*Disclaimer - This app is not affiliated with reddit. This is a port of big chungus to android. Flap chungus so hedoesn'thit the carrot monsters. Chunga chunga chunga chunga hu hahu ha. The combination of these seemingly different worlds makes foraunique celebration worldwide (!). The obvious connection with“theAchterhoek”, where the festival takes place, is noticeable inthetypical friendliness and hospitality of this region. Youngerandolder people still celebrate and party together. From thefirstedition (1,000 visitors) until the last edition in 2017(220,000visitors) one thing stays clear for visitors and theorganization:nothing is impossible! This is the official set of Luxembourg Emojis, or as we call them:EmoXies. With their signature look, the EmoXies playfully reflectdifferent facets of our beautiful country and give you an insightinto the Luxembourgish way of life. The Luxembourgish emojiinterpretation is fun to use and can easily be integrated into yourdigital communication. Simply install the application and startsharing over 100 EmoXies with the world. The EmoXies are publishedby the Ministry of Foreign and European Affairs of Luxembourg onthe website www.emoxies.lu. Happy EmoXie-ing! FastTV Lite+ lets you watch your favorite TV channels acrossvarious genres such as Entertainment, Sports, News, Music, Moviesand many more available across different languages. Note: -Pleaseconnect to Fastlink 4G, Neworz 4G or Newroz ADSL network inKurdistan, Iraq to access the service. -FastTV Lite+ is free todownload but watching videos will consume your internet databalance. Mahar - Stream or download from the world biggest archive ofMyanmar cinematic movies and videos. Wearable motion-activated musical bandz that send a Bluetooth®signal to the SoundMoovz™ App on your smart device. By simplymoving your hands and / or feet; create beats, rhythms and music orlayer your beat onto a song. Connect your smart device to a speakerfor louder music. The only limit is your imagination. Mystic Mondays is a tarot for the modern mystic. The tarot can beused as an intuition tool to help you clarify your day to dayquestions and guide you towards better decisions for yourselves.When you go inwards, often times you already know the answers toyour questions. Trust your inner voice, and let it guide you! BetaFeatures: 1. Card of the Day - Choose a card of the day that willreset at midnight. You can use this card as guidance throughoutyour day. 2. Tarot Library - Use the Tarot Library as referencewhen searching through the card's upright and reversed meanings. Now you can hear one of the BEST memes from all the internet. Thefamous DUN DUN! from the serie L&O. Listen at it as many timesas you want for FREE. Make the best MEMES with this sound button. Push the MLG Goat Button to play the fighting and screaming GoatSounds. Simply start with the "Go"-Button and see the Goat SoundButton. Push it and hear the MLG Goat Sound or switch to anotherButton with swipe gesture.